So this weekend, as Caroline and I made these snickerdoodles, I felt like I had come full circle. I portioned out the dough and rolled it into balls, she rolled them around in the cinnamon-sugar, and we sat in front of the oven to watch them bake. We split one, warm from the oven, as soon as they were cool enough to grab, and I was instantly transported back to my mom's kitchen. These cookies tasted exactly like the ones I used to eat as a child. And then, when I looked over the recipe I used, I saw that it was in fact from Mrs. Field's Cookie Cookbook! Full circle, indeed! Whether it's because they are nostalgic for me or not, these snickerdoodles really are perfection. Soft and chewy on the inside, with just a touch of crispiness around the edges, and that oh-so-important cinnamon-sugar coating. Love at first bite. In a medium bowl, whisk together the flour, salt, baking soda, and cream of tartar. Set aside. In a large mixing bowl, cream the butter and sugars together at medium-high speed until smooth and creamy. Add the egg and vanilla, and mix until well-combined. Add the flour mixture, and mix at low speed just until the dry ingredients are incorporated. Cover the bowl and chill in the refrigerator 30 minutes to 1 hour. Meanwhile, preheat the oven to 300 degrees Fahrenheit, and line 2 baking sheets with parchment paper. In a small bowl, mix together the granulated sugar and cinnamon. Measuring out about 2 1/2 tablespoons portions, roll the dough into a small ball. Roll the ball in the cinnamon-sugar mixture, and transfer to the prepared baking sheet. Press very lightly with the palm of your hand to just slightly flatten the ball. Repeat with the remaining dough, spacing each ball about 2-3 inches apart. Bake the cookies 12-14 minutes, rotating the pans top to bottom and front to back about halfway through. They will still seem under baked, but they'll cook more as they rest, and will be soft and chewy in the middle. You just can't go wrong with a roll in some cinnamon sugar! 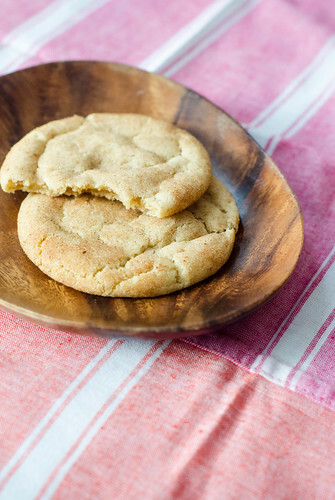 Snickerdoodles are definitely classic with good reason. I love snickerdoodles! These cookies are lovely.